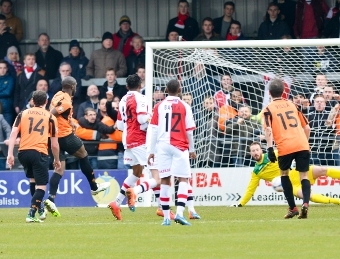 WOKING came unstuck at The Hive as Barnet benefited from a controversial first-half penalty and red card. CALL it six of one or half a dozen of the other but these promotion chasers had banked a stable but unspectacular six points apiece during a dry January. 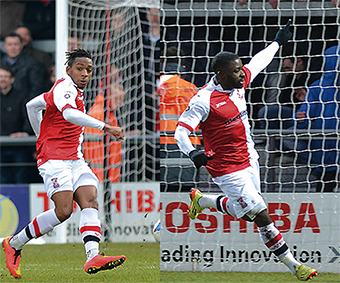 While Woking went the month unbeaten in the league (drawing three and winning one), Barnet won two and lost two. So despite conceding a five-place and 16-point gap to the league leaders at kick-off, Cards could argue that they were the form side. Always reliable for a sound bite, Bees boss Martin Allen spoke pre-match of how his team are ‘looking over their shoulder’ at the chasing pack after a January wobble. And Allen challenged his players to refocus their sights, starting by ending a nine-game winless run against Woking stretching back to the old Underhill days. With Bees old ground and its terribly notorious slope now but a memory, around 500 Cards fans travelled to north London to sample the rather more plush facilities offered at Bees’ new Hive home; all helping to generate a big game atmosphere for this promotion clash. With a boisterous crowd acting like a 12th man for both sides, neither XI needed any further assistance from referee Robert Whitton, but for those hoards of visiting Cards fans it seemed like the hosts got the rub of the green from the man in black on the day. Mr Whitton became the centre of Cards’ consternation after awarding a seemingly generous home penalty before red-carding defender Joe McNerney with just 27 minutes on his watch. The early double disciplining all but dashed the travelling fans’ hopes of seeing a repeat of last term’s 3-1 Hive win. Speaking after the game, a perplexed Garry Hill said the club may well appeal the McNerney sending off – however the club subsequently accepted a one-game ban on Monday. “There’s a little bit of history, it might be a coincidence, we had Barnet at home, we had the same match referee,” bemoaned the boss, who thought his dismissed defender’s card was marked from the start by the referee who also took charge when these sides drew 1-1 at Kingfield in November. “Joe McNerney got punished [inthe home game], which was missed by the referee on the day but the assessor punished Joe McNerney and he got suspended for three games. Hill also admitted post-game that, so miffed was Cards’ Chairman Mike Smith by the referees handling of the fixture, that even he felt compelled to visit the official’s dressing room to discuss the issues of the day. 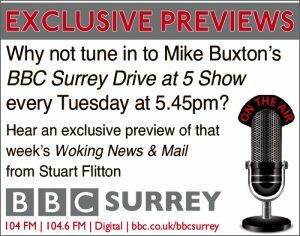 Ref Whitton no doubt drove away from The Hive car park with his ears buzzing after that exchange of views. Top of Smith’s debating agenda was surely that 27th-minute tangle between McNerney and Conference top-scorer John Akinde. Racing flat out to meet home winger Lee Cook’s through ball, the two men collided, seemingly with the initial contact taking place outside the penalty area. However, the ref pointed to the spot before compounding the sense of disbelief among Cards’ fans behind the goal by pulling out a red for the Woking man. Akinde duly dusted himself off to dispatch his 24th league goal of a prolific season. With a McNerney-sized gap to fill for over an hour, Hill pressed returning left-back Aswad Thomas into service alongside Joey Jones in a makeshift central defensive partnership. But the new look rearguard couldn’t hold out, as Hill’s utility man Jones unwittingly doubled Barnet’s lead when he spectacularly diverted an innocuous-looking Conor Clifford pass into his own net from outside the penalty area five minutes after the break. But despite the numerical disadvantage, Woking continued to fight on and Yemi Odubade set up a grandstand final 10 minutes, having entered the fray with half an hour remaining. Forty yards from goal, the pacy plunderer latched on to an Adam Newton punt before turning on the afterburners to outstrip defender Jack Saville and dispatch a fierce left-foot drive past keeper Graham Stack from close range. Boss Hill was full of praise for the shift put it by his outnumbered troops, including his new January signings. “We stayed in the game. Yemi’s got in behind them, showed great pace; great finish, and all of a sudden, I believed at that time, it was very much Woking on top with 10 men against the league leaders, who were hanging on,” said Hill. Having halved the deficit, Hill pushed forwards John Goddard and Kevin Betsy up alongside Odubade, as Woking peppered the Barnet box with crosses. And they came within a whisker of pinching a point in stoppage-time, as Josh Payne whistled a Betsy knock-down inches over the crossbar. 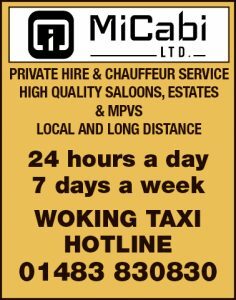 WOKING: Cole, Newton, McNerney, Jones, Thomas, Banya (Odubade, 62mins), Ricketts (Goddard, 62mins), Payne, Arthur, Rendell, Lafayette (Betsy, 34mins).